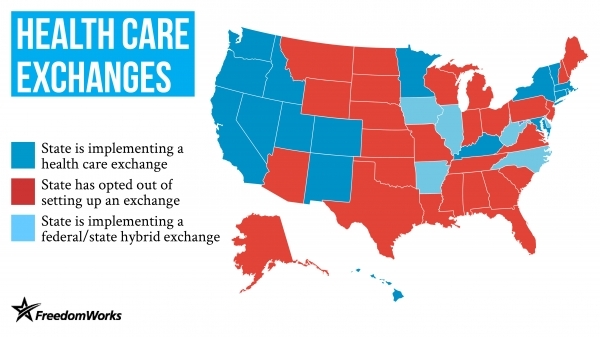 A brief recap of why resisting the exchanges is so important: ObamaCare does provide for the Department of Health and Human Services (HHS) to be able to set up a federal exchange for state which fails to participate, but the law was written with a massive flaw - the health care law as written only allows the federal government to fully operate within a state-created exchange. Because of this, a federally run exchange should not be able to either distribute the crucial insurance premium subsidies or enforce the penalty on employers which do not insure their employees (the employer mandate). Without the subsidies, and without the employer mandate, ObamaCare absolutely does not work, and Congress will have no choice but to act to revise the law – which provides us with the opportunity to dismantle it. More details can be found HERE. HHS, which was clearly completely unprepared for such a large number of states to resist the exchanges, is attempting to cajole these 27 states into entering into another version of the exchange – a federal-state “partnership exchange”. Unfortunately, even some governors who oppose ObamaCare have been lured by the idea that the partnership exchanges may be the best of a bad deal. However, Ohio Governor John Kasich sums it up well - "Regardless of who runs an exchange, the end product is the same." Instead of assisting HHS, states which are not setting up a state exchange should just hold their ground and let the federal government deal with the work (and the cost) of setting up the exchange. Doing so will very likely delay the implementation of ObamaCare, and should force Congress to reopen the bill so that we can dismantle it. HHS has already essentially conceded that its timeline is in danger by indefinitely extending the deadline for states to establish an exchange. At the very least, delaying HHS will buy more time for a crucial lawsuit being pursued against ObamaCare, filed by the state of Oklahoma (more to come on that lawsuit in a future post). Several governors of states which have rejected the exchanges will be subjected to immense pressure by the administration, by insurance companies, and in some cases by their legislatures to change their course and implement an exchange. This is where the grassroots come in. FreedomWorks has revamped and re-launched www.blockexchanges.com with a new action map where you can click on your state to take action against the health care exchanges in that state. The website will be kept up to date as states change their minds on whether or not to resist ObamaCare, so be sure to check back from time to time. It is almost inconcievable that, as President Obama prepares to swear the oath of office for a second time, the proponents of limited government may still hold the keys in the ObamaCare debate. But if enough of the states just hold their ground from here, we may just stop the government takeover of health care.